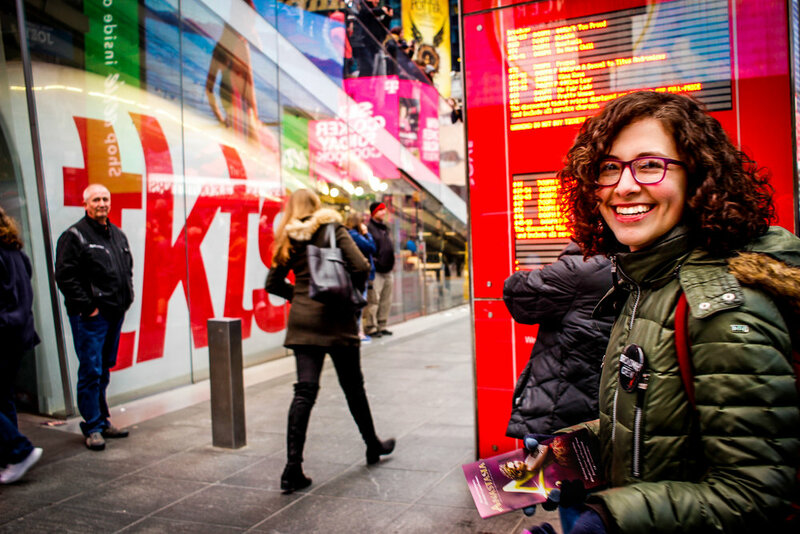 Our awesome crew member Tova having a blast at the TKTS booth in Times Square. First, a little background: TKTS is a ticket selling service run by the not-for-profit Theater Development Fund and is the best place to go to get genuine, discount same-day tickets in NYC. The booth stocks the best available discount tickets at various price-points and works in concert with each show’s box offices to distribute their unsold, same-day tickets. There are two satellite booths at South Street Seaport and The Lincoln Center, but the main event is on the corner of 47th and 7th Avenue in the heart of Times Square, open 365 days of the year. Here are some key tips for how to navigate the booth while not going insane or getting scammed into a dodgy show and potentially ruining your trip! 3 pm - 8 pm Mon, Thurs and Friday. You should aim to arrive an hour before the booth opens. This way you *should* only have an hour wait in line. Ok, ok I just said to get there early, but if you aren’t picky about seats or the show you want to see, wait until a couple of hours after the booth has opened. The line usually lasts about an hour and afterwards there will still be tickets, and you won’t have to line up! For your benefit, there are really nice TKTS patrons services people out there (look for the red coats/shirts) as well as many great promotional teams to help you with your ticket buying decisions. Unfortunately, you’re still in Times Square and there are also less scrupulous people that will do their best to trick you into seeing sub-par theater. Knowledge is key here. If you plan on sticking around for a few days, keep your ticket! There is a fast pass that allows returning customers to skip the line! Just show security your ticket (that you purchased at TKTS, other tickets won’t work) and they’ll put you in the special queue. It is typically on the 7th Avenue side. 5. There’s a Play Only Line. Looking to see a play and not a musical? There’s actually a play only line on the other side of the booth (Broadway side) that often has no line at all! If a show is marked with a P on the board, then you’re able to buy it from this side. Be sure to take advantage of this-because who' likes waiting in line? So there you go! Follow these tips and make your trip to Times Square so much easier and more enjoyable. Also, look for the Broadway Crew team members while you’re out there. Our team is always there to help you find the show you’re looking for!